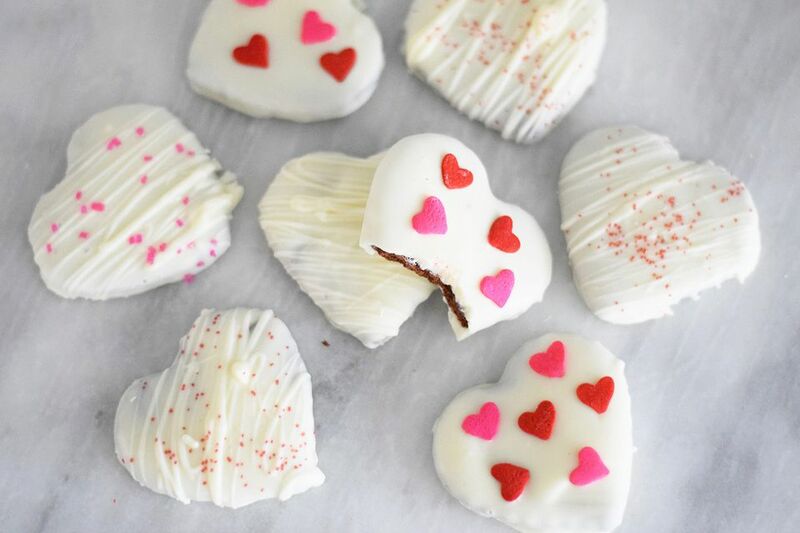 These white chocolate thin mint hearts are crunchy, minty, chocolatey and super addictive! They are covered in rich white chocolate and sprinkled with adorable Valentine's colored sugar. A great treat for your Valentine's sweetheart! The delicious cookie recipe is based off of a thin mint cookie recipe from Baked By An Introvert. Sift together the flour, cocoa powder and salt in a medium sized bowl until well blended. In the bowl of a stand mixer, beat together the softened butter and sugar for about 2 minutes or until creamy. Beat in the egg white and then add the vanilla and peppermint extracts. Slowly incorporate the flour mixture until it is completely combined with the butter mixture. It should form a slightly firm dough, similar to a sugar cookie dough. Split the dough in half and place each half between two sheets of parchment paper. Roll out the dough between the parchment paper until it is a thin sheet, about 1/8-inch thick. Repeat with the second half of the dough. Stack the sheets on top of each other and place in the refrigerator or freezer to chill. If placing in the refrigerator it will take about 3 hours to chill. It will take half of the time in the freezer. Preheat the oven to to 350 F. Line 3 baking sheets with parchment paper. Remove the dough sheets from the refrigerator and use a heart cookie cutter to cut out the hearts. Transfer them to the lined baking sheets, ensuring to place them slightly apart. These cookies won't rise or spread very much so they can be fairly close. Allow them to cool slightly on the pan and then transfer to a cooling rack. Roll out the scraps and cut out more hearts from them as well. The cookie dough may be a little soft so you can chill it again before cutting them out. When the cookies are almost completely cooled, melt the white chocolate in the microwave in a microwave safe bowl. It's best to microwave it in 30 second increments, stirring in between until it is completely melted, otherwise the chocolate will burn. Dip each cooled cookie into the melted white chocolate and coat on all sides. Use a fork to remove the cookie form the melted chocolate. Let the excess chocolate drip from the cookie and then gently place it on another piece of parchment paper. Sprinkle with red or pink sugar or heart sprinkles immediately. Repeat with remaining cookies. Allow the white chocolate to set for at least 45 minutes, then pack in a plastic container or bag until you are ready to serve. You can also freeze them and they will last even longer!